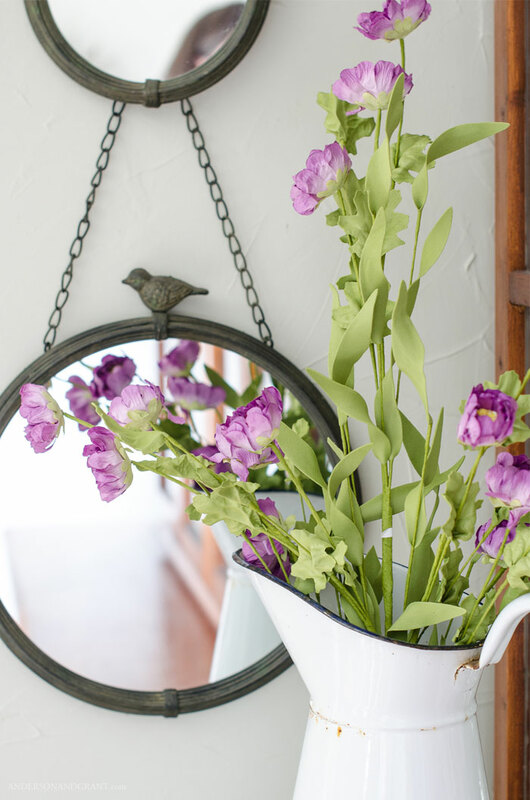 For that reason, it is nice to have some faux flowers to arrange that at least mimic the feel of the real thing. 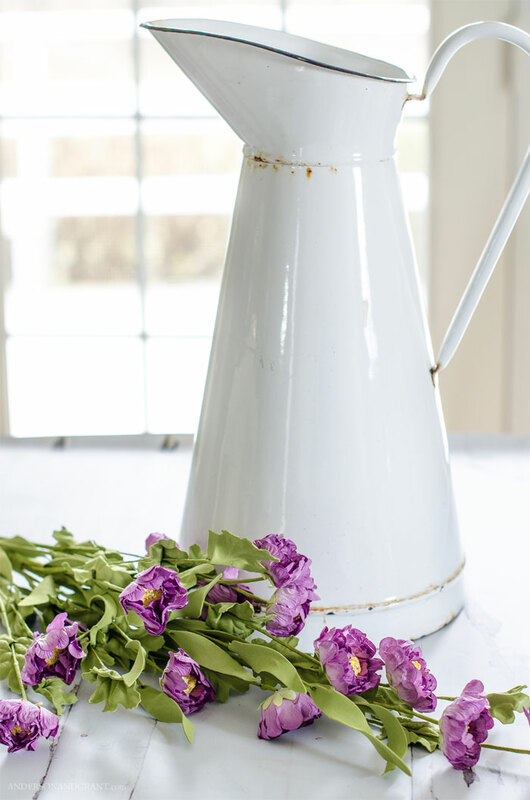 Although they lack the sweet smell, they can look just as pretty as an arrangement in the center of your dining table or on your nightstand. 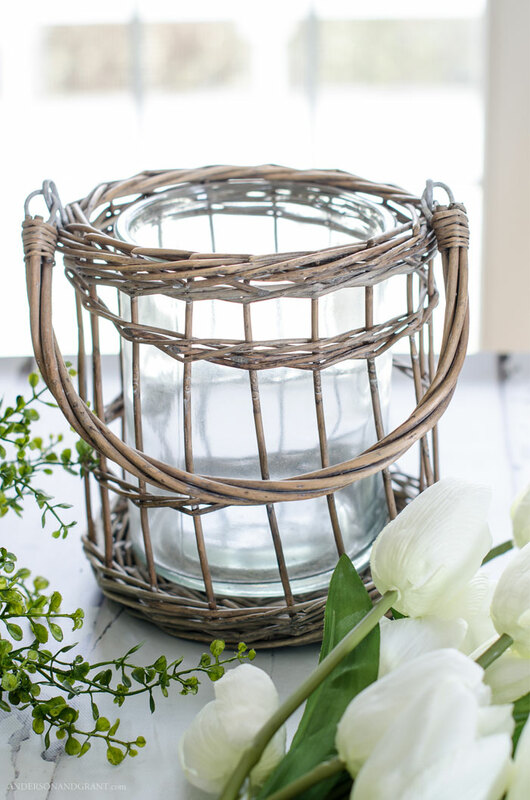 Begin with a decorative container that you love. 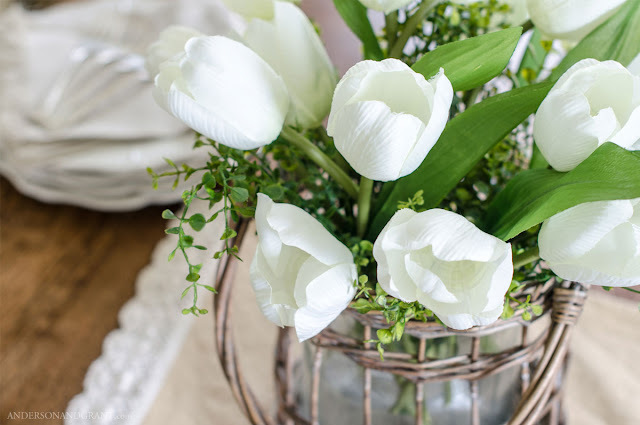 What you are placing your flowers in is just as important as the flowers themselves. 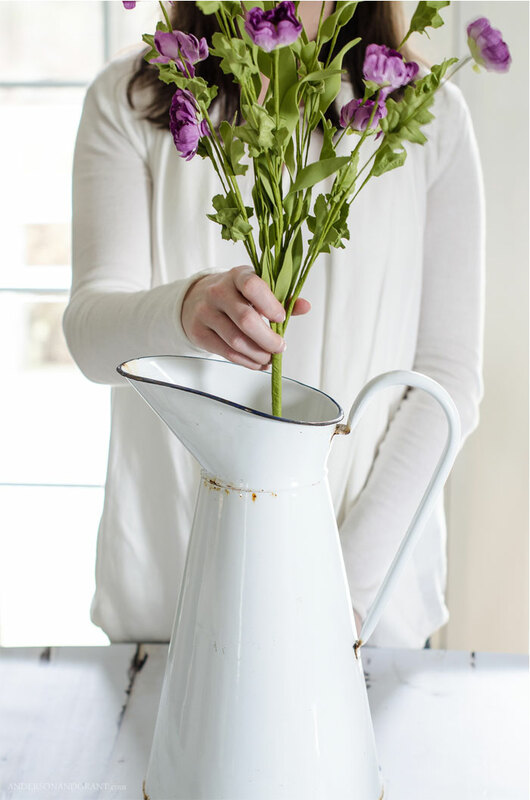 And you don't have to choose a vase. 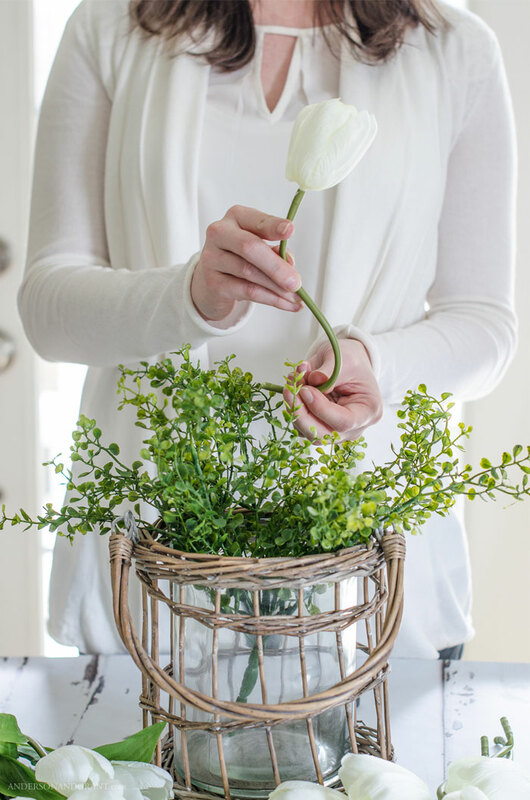 You can make a flower arrangement in a pretty bowl. Or a mason jar. Or a vintage tin with the lid taken off. Or........ You get the point. 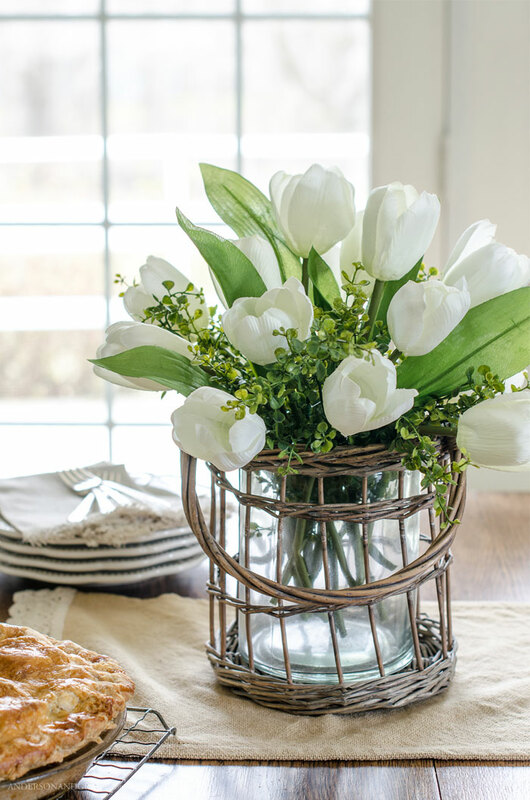 Look around your home and find something a bit out of the ordinary to hold your arrangement. 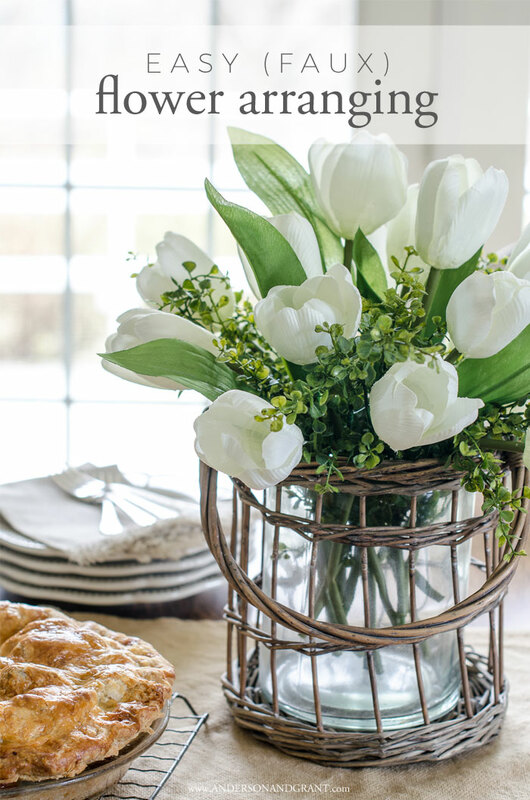 The first secret to making your faux flower arrangement look less fake is to choose flowers that appear realistic. They don't have to be expensive stems that cost $10 apiece. All of the tulips in my arrangement were from one bush that I got at Michaels for $1.99 on sale. Hobby Lobby also has really pretty flowers that you can get for a low price by watching their sales or using a coupon. 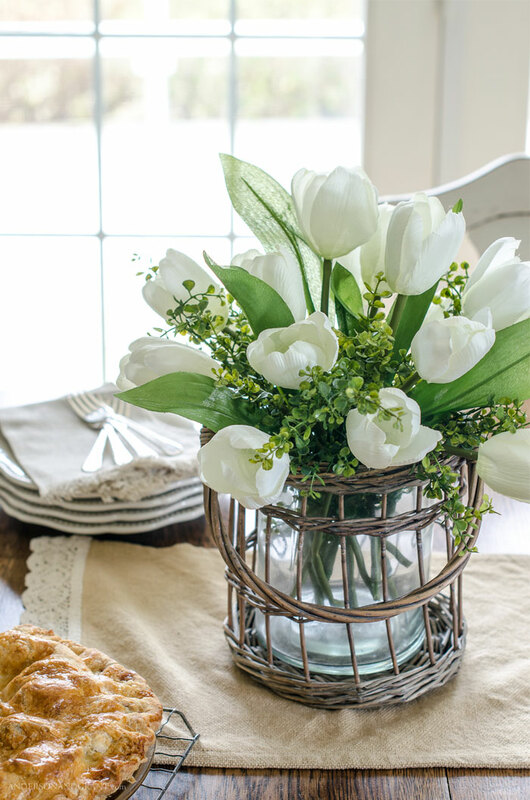 My favorite part about these tulips is that the stem is thick and really resembles that of a fresh flower. The flower petals have texture to them which helps give a more realistic feel. 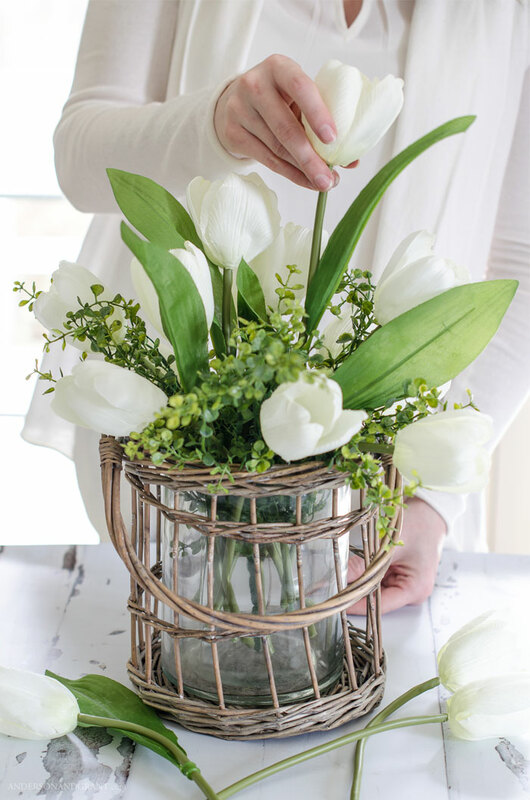 All it takes is a few snips from a pair of wire cutters and you've got a bunch of individual flower stems to arrange. 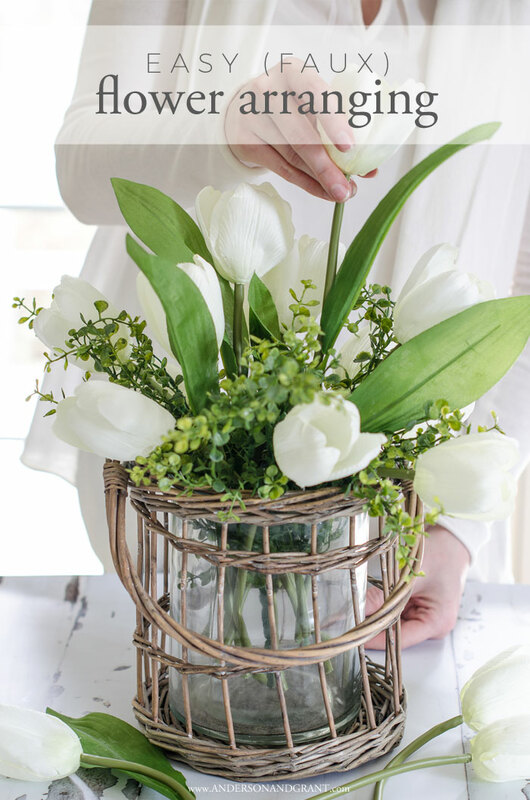 And the third secret to realistic faux flower arranging? Bend the stems. A real flower does not stand perfectly straight on it's stem. 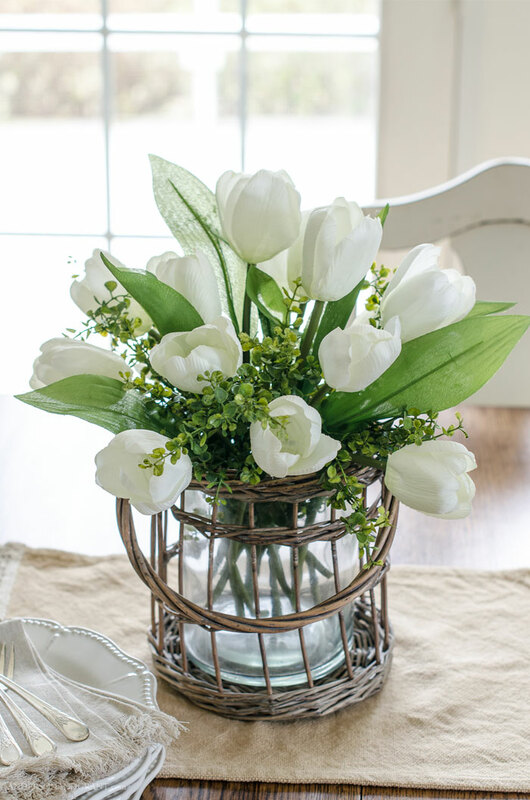 And flowers like tulips often droop over the sides of their container when placed around the edges. 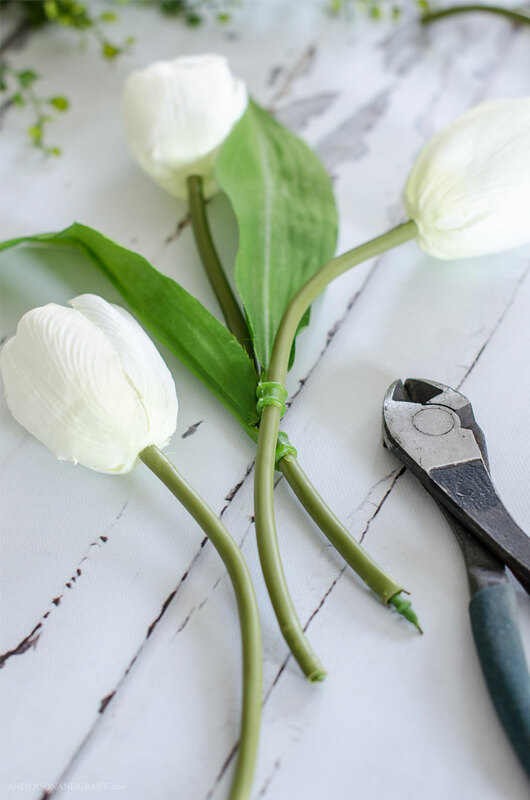 Adding a gently bend to the wire stem will let it stand more like a real flower. 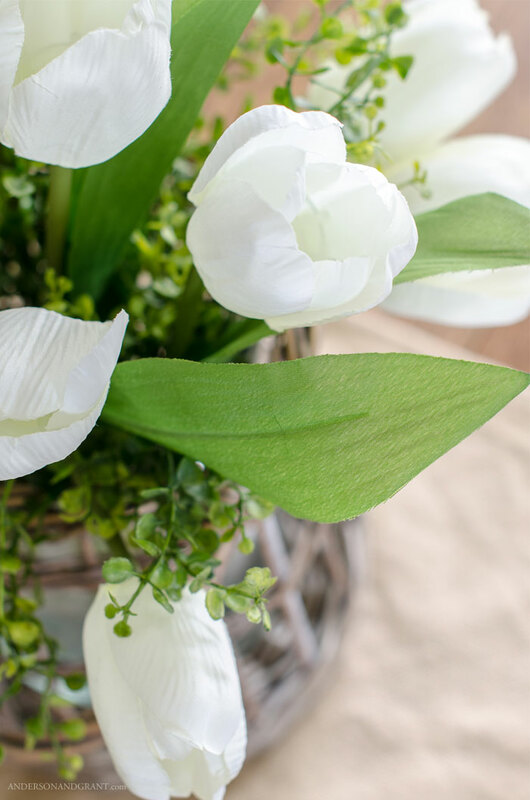 In addition to your choice of faux flower, you'll need to pick up some (realistic) type of greenery or bushy flower that mixes with your flower choice. 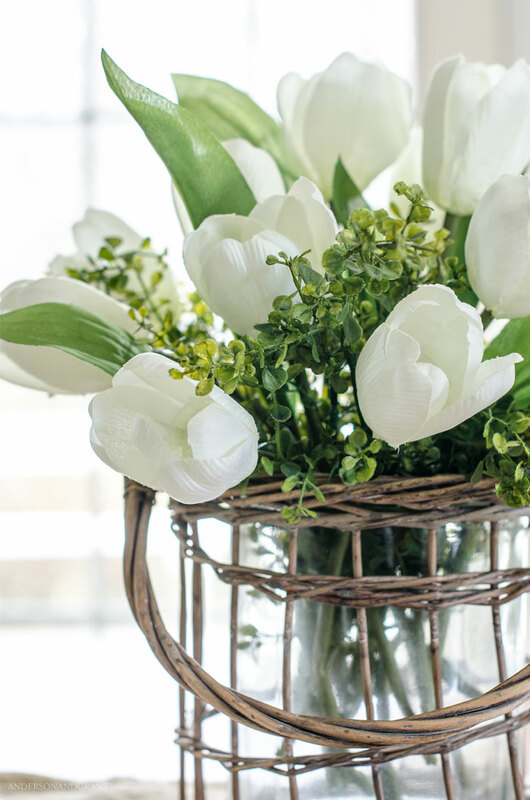 This acts as a filler to make your arrangement feel more grand. And as an added bonus, the filler will act as a flower "frog" and hold everything in place. 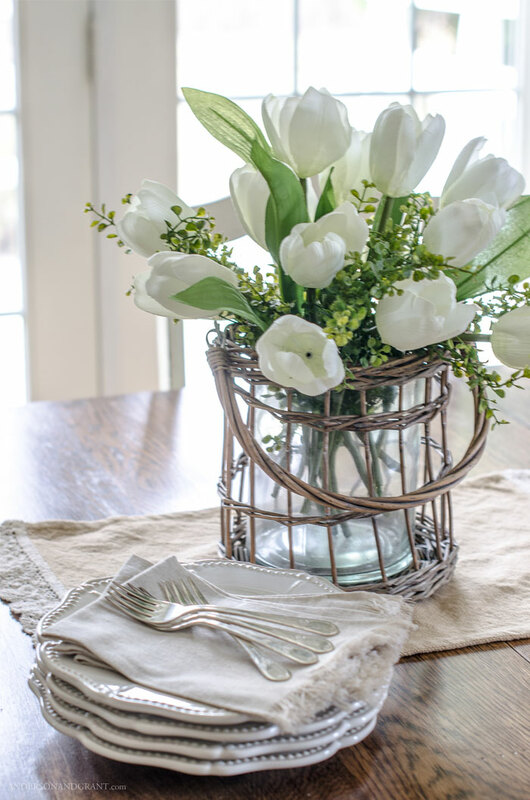 Look for something that will not only add some body to the arrangement, but will also spill down the sides a bit like this one does. 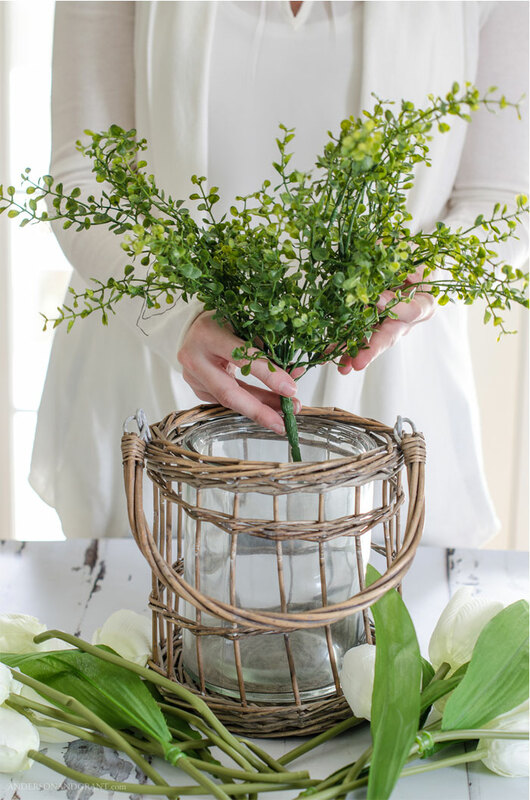 Place the bush of greenery into your container of choice and do a little fluffing to distribute it around. 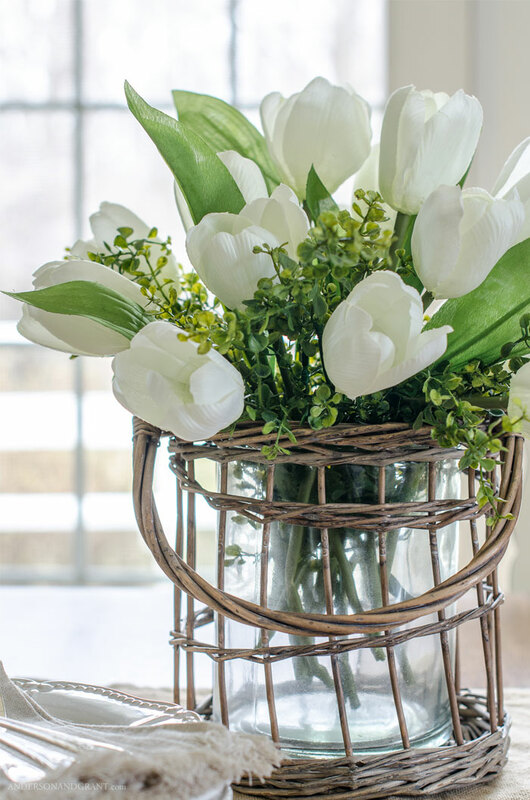 Take a look at your arrangement from all angles and adjust the flowers if needed. Like I said, you want the arrangement to be even, but not perfectly spaced from flower to flower. 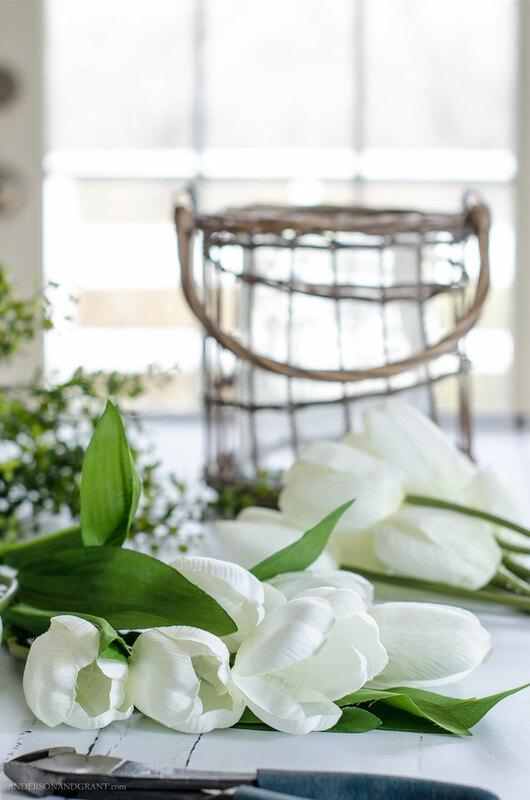 What you'll end up with is a floral arrangement that looks like you put thought into your decorating and spent time creating something, rather than plopping a $2 bush inside a vase. Again, you'll need to choose a decorative container. 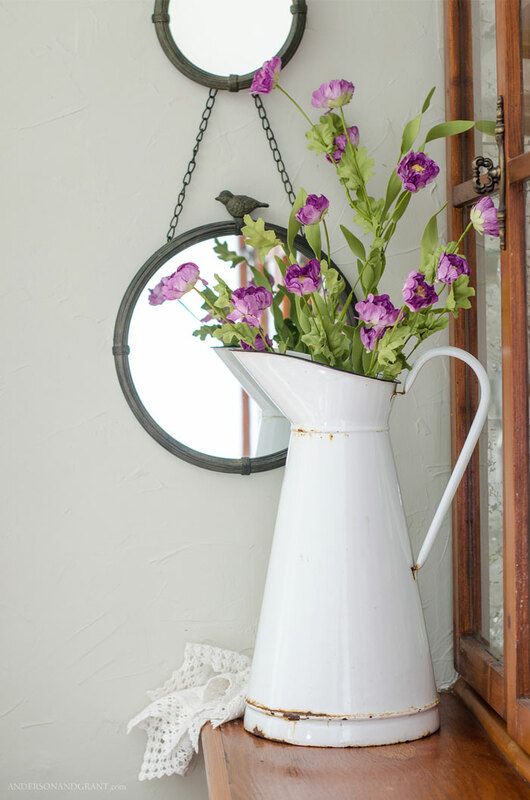 For these flowers, I picked a vintage enamelware pitcher. The white contrasts nicely against the purple flowers and green leaves. 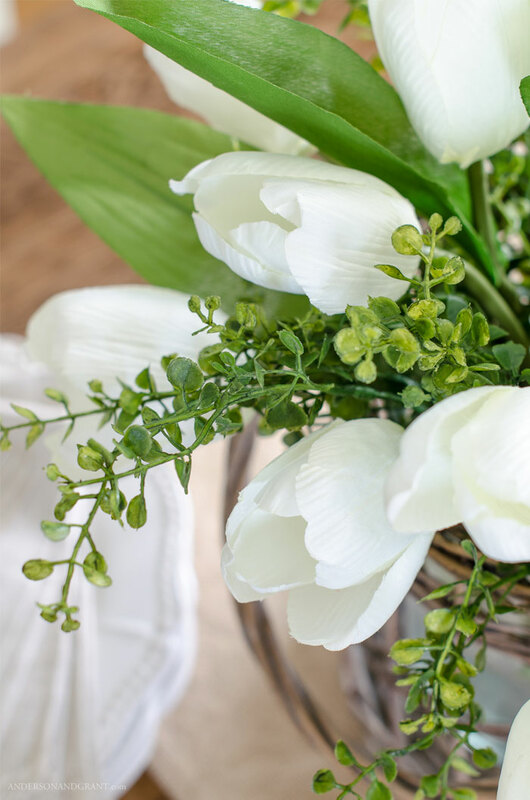 This single bunch of flowers is a bit more fancy and has stems that are of different lengths with two different types of leaves. For that reason, there is no need to add extra greenery or cut anything apart. And admire your completed arrangement. 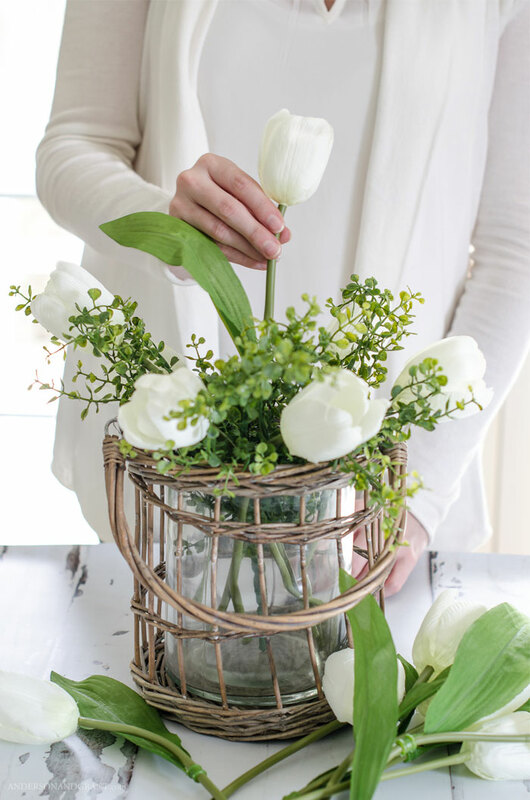 When you bring a bunch of (faux) flowers home from the store, they are all going to require a little fluffing, bending the stems around and adding a little something extra to make a beautiful arrangement. 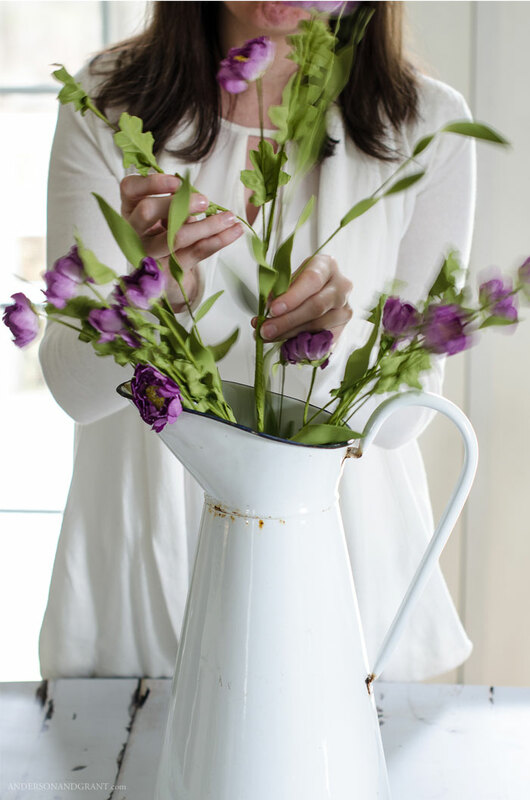 But unlike arranging real flowers, these ones will last for as long as you are enjoying your work. 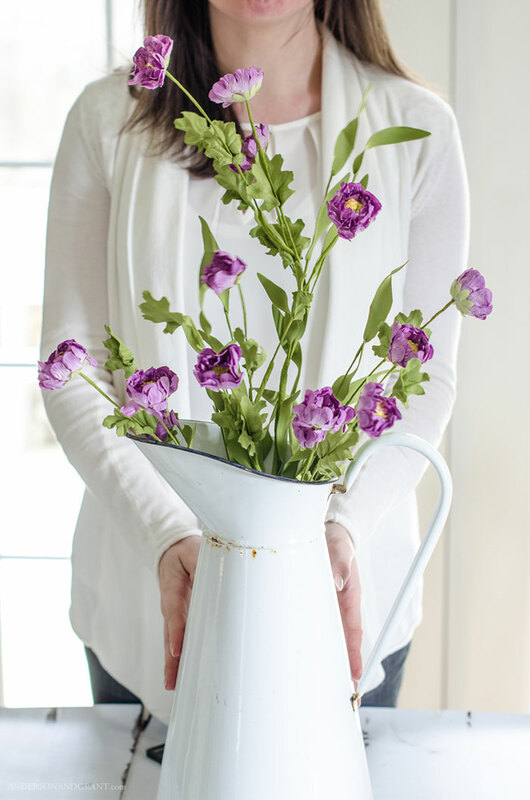 An arrangement of faux flowers can be just a pretty for everyday decorating and will cost you a lot less.